Oil on canvas, 50 1/8 x 60 1/8 in. Bruce Museum, purchase from the artist, 1919. 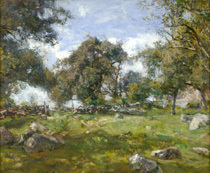 The Bruce Museum presents a retrospective exhibition of paintings by American landscapist Charles Harold Davis (1856-1933) with support from the Connecticut Office of the Arts, The Charles M. and Deborah G, Royce Exhibtion Fund, and a Committee of Honor co-chaired by Nancy Duffy, Leora and Steve Levy, Alice Melly, Linda and Steve Munger, and Lynne and Richard Pasculano. 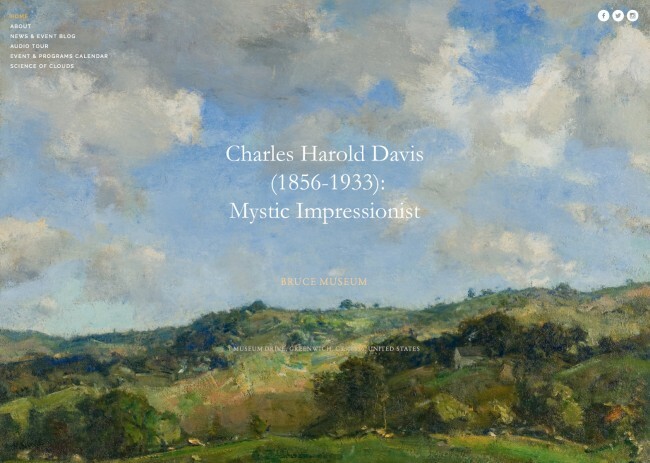 At his 1934 Memorial Exhibition, Davis was hailed as a figure who would take his place beside the greats of literature and art —Hardy, Millet, Tolstoy — yet today he is little known. 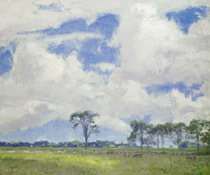 The grand praise he received in his time speaks to his ability to capture the shifting moods of his native Connecticut landscape, from the calm of a breezy summer day to the bittersweet twilight of late November. An influential figure in his day, he exhibited at the famous 1913 Armory Show in New York and established the art colony in Mystic, Connecticut. Yet in the modern era, Davis’s work has received scant scholarly attention. The upcoming retrospective of Davis’s paintings at the Bruce Museum, the first in decades, offers the public a chance to rediscover a leading American landscapist. The exhibition will include works from throughout Davis’s prolific career, highlighting his transformation from a delicate Barbizon style to an atmospheric Impressionism and the bold, expressive style of his final years. A catalog for the exhibition is available. Click here for public programs held in conjunction with the exhibition.